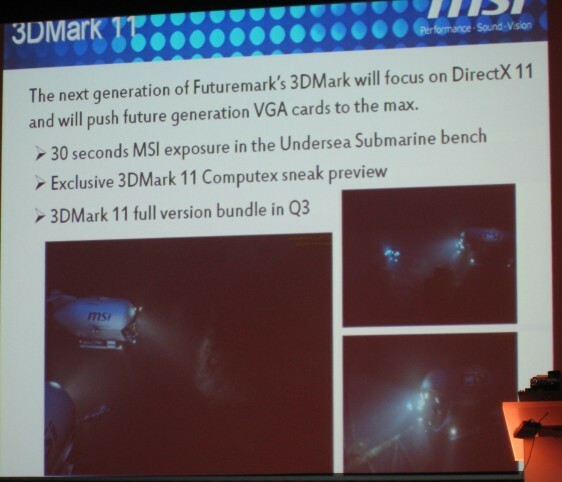 Futuremark is readying the next generation of its popular 3D graphics benchmark, the 3DMark. The new version will be called 3DMark 11 (probably named after the year 2011 or DirectX 11), and will strive to be every present-generation GPU's worst nightmare (stress test). With NVIDIA's entry into the DirectX 11 generation of graphics following ATI making the new GPUs "current", 3DMark 11 will focus on the GPUs' DirectX 11 capabilities, probably exploiting new texturing and hardware tessellation features. The benchmark will be able to push present and future GPUs to their maximum capabilities. At least one of its game tests have been known to be called "Undersea Submarine". There is no mention of NVIDIA PhysX, so it's safe to assume that the benchmark will use industry standard features which are available to all DirectX 11 generation GPUs. However, similar to a marketing deal with Sapphire for 3DMark Vantage (where a certain game test showed a futuristic vehicle with Sapphire logo on it), this version will market MSI. What's more, it will be bundled with MSI graphics cards when the software releases. Futuremark will show off its latest creation at this year's Computex event held in early June, in Taiwan. The software will be released some time in Q3, 2010. Dropping proprietary phsyx for more open industry standards. I LIKE IT!!! Technical aspects aside, frankly, Vantage was a bit visually underwhelming. I hope they do a better job in the presentation department this time. Having loops with sound again would be nice too. I find it completely acceptable for MSI or Sapphire or anyone to pay to have their logo contained in the loops of the program, but I think a benchmarking utility as well known as 3DMark should not accept funds from GPU manufactures to make use of certain technologies. At the very least, it gives the impression of a conflict of interest in a program that should be unbiased to any particular hardware. If Futuremark wants to make use of heavy tessellation, that is fine, but they should not do it because they were paid by NVidia to, just like they shouldn't not use it because ATI payed them not to. Nvidia doesn't need to pay as the tesselation on their 4 series cards is superior to ATi's. Basically it's two tesselators vs. 1 with ATi. nV's tesselation is overkill though. They can't run decent framerates with the tesselators maxed out, but spreading the workload over more than one tesselator will obviously help control heat. People are talking up the wrong angles when it comes to tesselation. It's all about saving pci-e bandwidth, and multi-gpus, other uses are just wasting power. And with that in mind, I don't see tesselation being a highly weighted metric for scoring. Kinda scary that we gotta wait until 3rd quarter too...seems like premature annoucement syndrome. will we see vantage score dropped half with these new 3dmark? It seems to work with Uningine Heaven Bench. But yes, that benchmark does use too much tesselation. Either way benchmarking using synthetic apps. just isn't my thing anymore. Fraps + games is what I like to use and you get to play. :) It will be interesting to see how this new bench is implemented, hopefully it's completely different from Vantage wich is pretty fail for a "gaming" benchmark tool. Yeah, I know that you and I are eye-to-eye on alot of things, this included. Vantage has never been a decent bench...far too cpu limited on the "game" benches. There's no way, if a bench is programmed right, that increasing cpu speed will increase gpu scores. I understand why it's that way currently, but can't help but think that's the wrong approach. I really wonder, with Shattered Horizon out, and patched heavily, how long they've really been working on this. Seems to me this announcement is due to them finally getting the proper funding to make a new one(Thank you very much for that, MSI!~). I bought Shattered horizon ,but have only played it once..I was buying to help support them until the next 3DMark, and that's it. Let's hope it ISNT a 1500MB download, and let's hope it doesnt take 20 minutes to run the benchmark, and let's hope it isnt boring to watch by repeating the same routine with and without sound. I'm actually hoping for a long bench, as this will limit the extreme cooling guys a fair bit..harder to keep things stable long-term than short benches like S~Pi. Something is needed to push these guys to the next level, and that ASUS daughter-board garbage isn't it. I admit I don't find it as fun to see LN2 cooled runs anymore. The game (which I just lost) needs to evolve. Yeah, well, anyone can splash some LN2 into a copper pot and run a bench. Do it enough, and you can exceed the top guys, if not beat them, provided you had access to the same amts of hardware...the whole Gigabyte "OCGuru is YOU!!" contest had 2 Gigabyyte employees in the top two spots until someone made a stink about it. I've been complaining about this same issue for many years now, so it was good to see that was put out in the open, rather than being told I'm nuts, and it's not true. Any respect I lost for "Fugger" when I got banned so long ago was trippled back up when I saw that posting of his... I guess he gets my point now. I don't really see anyone taking real drastic steps, modding boards, etc, to get top scores. It's just a matter of finding the right chips at this point, as current VGAs and boards take all the guess work out of the equation. And now with the top guys livestreaming bench sessions, I know I'm 100% right, as I've watched them all. I can count the guys actually innovating benching on one hand. The overclocknig scene is even worse than when I left. But most of the decent guys have left too, so that's no surprise, either. And with that in mind, it seem FutureMark has lost alot of importance in the industry too. I mean really...how come I was the only one that understood, at first, why FM pulled nV gpu phys-X scores? Because you don't have to udnerstand how things work to get top clocks any more. And I'll take this moment to apologize to everyone, as I've been a bit sour in my posts the last couple of days...not due to stress or anything like that...It was actually seeing the ASUS daughter board that started it all for me. I really am gonna buy a Dell. And I'll buy Corsair Ram. None of those other hardware companies will get any of my cash any more. Now I think about it you don't see so much of the "holy crap I've got a golden chip" anymore where someone is lucky and gets a great overclocking chip for cheap. I lost interest in vantage and erm I really enjoyed trying to benchmark in 06. I think that was the last good one. Thanks guys...at least it seems I'm not crazy for thinking some of these things..I mean, I come up with some pretty wild ideas some times. Sweet ! I've never got a golden anything or silver but I like my i7. Thank God! Been waiting for over a year now to hear news. I'll wait for details before I start caring enough to pick it apart. lol they got jealous of Uniengine getting all the dx11 bench glory. bout time, vantage was horrible for dx10 testing, didn't really push dx10 for what could be done at its time of release. Now 3dmar06 did a good job imo of testing cards for that time frame it was released. I hope Uniengine has made futuremark realize they need to sharpen up.